Soon after the 1804 gubernatorial election in New York—in which Morgan Lewis, greatly assisted by Hamilton, defeated Aaron Burr—the Albany Register published Charles D. Cooper's letters, citing Hamilton's opposition to Burr and alleging that Hamilton had expressed "a still more despicable opinion" of the Vice President at an upstate New York dinner party. Burr, sensing an attack on his honor, and surely still stung by his political defeat, demanded an apology. Hamilton refused because he could not recall the instance. Following an exchange of three testy letters, and despite attempts of friends to avert a confrontation, a duel was scheduled for July 11, 1804, along the west bank of the Hudson River on a rocky ledge in Weehawken, New Jersey. This was the same dueling site at which Hamilton's eldest son, Philip, had been killed three years earlier. At dawn, the duel began, and Vice President Aaron Burr shot Hamilton. 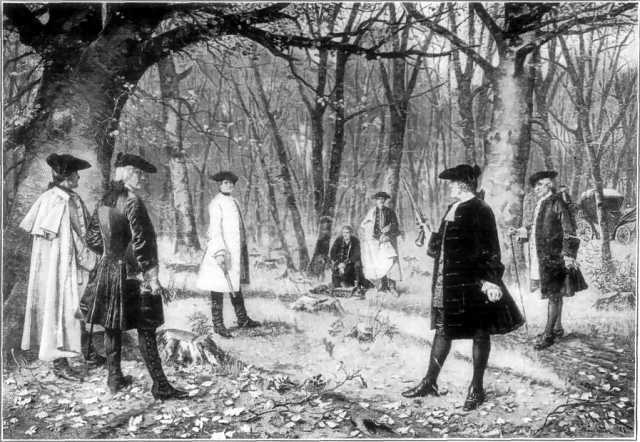 Hamilton's shot broke a tree branch directly above Burr's head. A letter that he wrote the night before the duel states, "I have resolved, if our interview [duel] is conducted in the usual manner, and it pleases God to give me the opportunity, to reserve and throw away my first fire, and I have thoughts even of reserving my second fire", thus asserting an intention to miss Burr. The circumstances of the duel, and Hamilton's actual intentions, are still disputed. Neither of the seconds, Pendleton or Van Ness, could determine who fired first. Soon after, they measured and triangulated the shooting, but could not determine from which angle Hamilton fired. Burr's shot, however, hit Hamilton in the lower abdomen above the right hip. The bullet ricocheted off Hamilton's second or third false rib, fracturing it and caused considerable damage to his internal organs, particularly his liver and diaphragm before becoming lodged in his first or second lumbar vertebra. Biographer Ron Chernow considers the circumstances to indicate that Burr fired second, after having taken deliberate aim. If a duelist decided not to aim at his opponent there was a well-known procedure, available to everyone involved, for doing so. According to historian Joanne Freeman, Hamilton apparently did not follow this procedure; if he had, Burr might have followed suit, and Hamilton's death might have been avoided. It was a matter of honor among gentlemen to follow these rules. Because of the high incidence of septicemia and death resulting from torso wounds, a high percentage of duels employed this procedure of throwing away fire. Years later, when told that Hamilton may have misled him at the duel, the ever-laconic Burr replied, "Contemptible, if true." The paralyzed Hamilton, who knew himself to be mortally wounded, was ferried back to New York and taken to the Greenwich Village home of his friend William Bayard Jr., who had been waiting on the dock. After final visits from his family and friends and considerable suffering, Hamilton died on the following afternoon, July 12, 1804 at Bayard's home at what is now 80–82 Jane Street. Gouverneur Morris, a political ally of Hamilton's, gave the eulogy at his funeral and secretly established a fund to support his widow and children. Hamilton was buried in the Trinity Churchyard Cemetery in Manhattan.